Although watering the lawn is a simple task, it does deserve some attention here. Whether you have an irrigation system or if you just use a sprinkler, the same rules do apply. When watering your lawn you should only do so early in the morning or in the evening, when the sun is very low in the sky. This will prevent the lawn from burning in the intense mid-day sun, as well as stop unwanted evaporation of the water. Watering your lawn should not necessarily be done on a regular basis. At least not as often as you may feel you should. The majority of the watering will be done during the hot summer months when rain is infrequent. In early Spring and late fall, when rain is more frequent you will not need to water the grass very often if ever. Giving the lawn several days between watterings will force the roots to grow deeper into the soil where it is cooler and there is more moisture available. This will both protect the lawn from the sun as well as reduce the chance for weeds to take over. 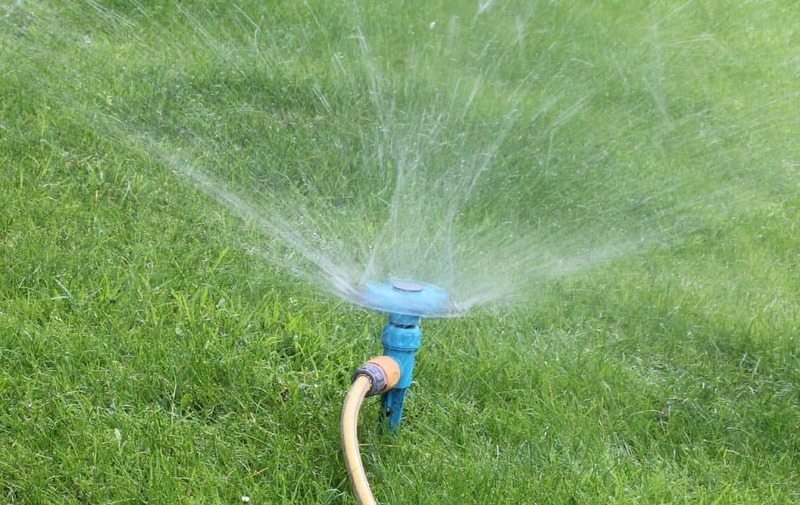 When watering your lawn you should try to use a gentle sprinkler that releases a smaller amount of water gradually so that the lawn has a chance to absorb the moisture. This will reduce run off and help prevent any erosion that can be caused by larger amounts of water being forced on to the lawn to quickly. The amount of water you should apply will be between 4 to 6 inches per watering. This will allow the moisture to go deep into the ground where you want the roots to grow. A good way to measure the amount of water you are applying is to put a small cup or dish on the lawn while you are watering. Check on the dish several times until the water inside it reaches the desired depth. (4 – 6 inches). When it gets to that amount you can stop watering. Remember not to leave the dish on the lawn after you are watering as it will restrict the amount of light reaching the grass underneath. If the lawn has a lot of thatch or the ground is very hard (clay soil) you may need to stop watering several times to allow the water to be absorbed into the ground instead of running off the top. If thatch is a problem you should have your lawn de-thatched. A hand de-thatcher is available in stores or you can rent a powered machine for larger lawns. If the soil beneath your lawn is very hard you may need to have it aerated in the spring or fall to help soften it for the summer months. This will allow the roots to grow better and give the water some place to go. An easy way to determine if the lawn needs to be watered is to just walk across it. If you can still clearly see your foot prints, it needs water. When the lawn is well watered. the grass will straighten itself back up rather quickly. If you have a sprinkler system in your lawn, you will want to make sure that it is maintained properly. Several times throughout the year you should check to make sure that all the sprinkler heads are working and are covering the designated areas. During the dry months you will see any spots that are missed by the irrigation system because they will be dryer and not doing as well as the rest of the lawn. Make sure that the system is programmed to go on early in the morning or evening and that it is only on for just enough time to give you the proper amount of water needed. Keep in mind that some cities and towns have strict water regulations when you may not be allowed to water the lawn due to drought or times of the day when water usage is at a premium. Check to make sure that you will not be violating these restrictions. If you live in parts of the country where the temperatures go below freezing you will need to have the system cleared of any water to prevent the pipes from freezing and bursting. This is a service that can be provided by many irrigations system contractors in your area. Another thing you might want to keep in mind is not to water your lawn soon before you cut it. This will just help to make everything a mess and it will make cutting the lawn a little more difficult for the mower. Although watering the lawn is one of the most important components to keeping it looking beautiful, you will also want to make sure that it is cut properly to give it that professional maintained look. To find out how to give it that pro look go the Proper lawn maintenance page. Watering will help to keep the grass growing but to keep it looking a beautiful shade of green you will have to feed it some nitrogen fertilizer several times throughout the year. There are many varieties of fertilizer for the lawn available on the market today, including some organics that seem to really do the trick. Check your local garden center for the one that would be right for you. Although properly watering the grass will go a long way to creating your perfect lawn. You still may be struggling with eliminating various pests such as grubs, chinch bugs and ants or maybe some popular weeds like dandelions and crabgrass are filling in the spaces between the blades of grass in your otherwise beautiful lawn, you may need to take some more drastic measures.